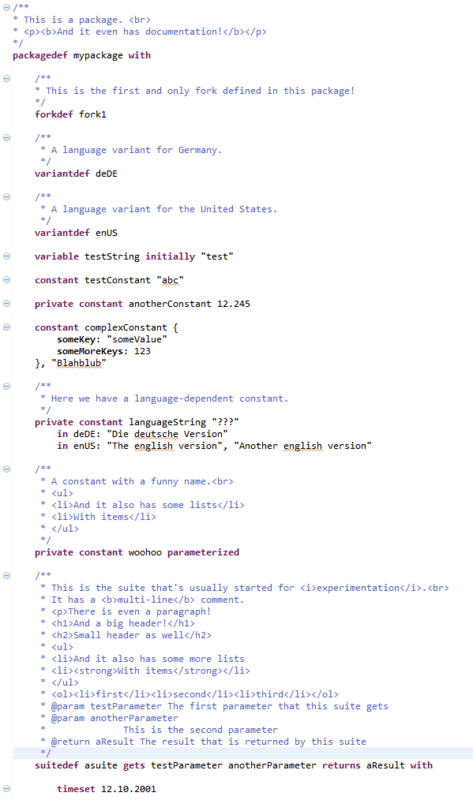 Of course the documentation texts support the same HTML-inspired formatting language that JavaDoc uses (well, at least all the well-known constructs, it's not 100% identical) so you can mark up your texts with headers, bold parts, paragraphs and lists. The documentation comments are used in two ways. 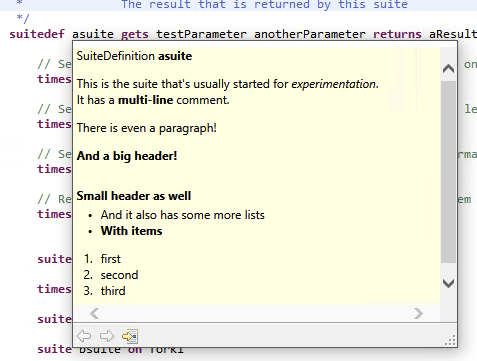 For one, they are displayed like JavaDoc in Java code in the Eclipse editor when writing tests. For example, the documentation for a fixture is displayed alongside that fixture in autocomplete or mouse-over scenarios. Likewise with suites, constants et cetera. You can use the timeset command anywhere in any suite, regardless whether it is called on a fork or on the master (timeset commands on forks are relayed to the master and executed from there, so one of the forks can even set the time of a different fork!). It supports progressing time as well as the more simpler concept of a "frozen" time that always stays the same. And in case of progressing time, where the previous mechanism inevitably led to deviations (due to your inability to call the "set the time" fixture on all forks at the exact same time) this new algorithm actually calculates the internal state of the test time generator on the master and pushes that to the forks, effectively resulting in a perfectly synchronized timebase across all forks and the master. Basically you specify the duration in years, months, days, hours, minutes, seconds and milliseconds and the direction (+ for a forward jump, - for a backward jump). As shown in the examples, you may use short units (y/mon/d/h/m/s/ms) or longer, descriptive units (year, month, day, hour, minute, second, the trailing 's' is optional), but the unit MUST follow the number without a space in between! Note that this feature only works since Integrity 0.17.20. Either you set the system property integrity.runner.timeadapter to the class name of your adapter implementation. Integrity will then try to instantiate it and call the interfaces' method on it (the code that does this is in de.gebit.integrity.runner.time.SimpleTestTimeAdapter, just in case you're interested). Or you use the Google Guice override mechanism of creating your own subclass of IntegrityDSLSetup, where you can override any Guice-injected part of Integrity (and the time adapter just happens to be one of those). There's extensive in-code documentation on all these interfaces/implementations, so you are greatly encouraged to take a look at them for further details! And there is also a Github Issue Link. It is now possible to inherit parameters from other fork definitions, so you may create "forkdef hierarchies" now, with forks inheriting stuff from other forks. See the Github Issue Link for an example.